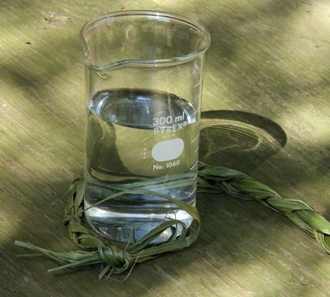 Sweetgrass Hydrosol… Canada's Sacred Water | Nascent Naturals Inc. In Canada, the spiritual, ceremonial and medicinal history of this sacred grass is quite profound and intertwined with the fabric of the country itself. Few other plants or herbs are revered and used in so many forms. It can be smoked, smudged, burned, distilled, made into tea, weaved into baskets, mats, bracelets, hair ties and ceremonial dress. I still have a pair of sweetgrass socks which were made for me many years ago. Quite often you will see the grass dried and braided as a tribute or representation of Mother Earth’s hair. The three parts of the braid are mind, body and spirit. Other reported traditional uses for the grass include a tea to relieve sore throats and nausea, inhalation of the smoke to stop nosebleeds and salves to soothe dry chapped skin. The dried herb, distilled water and smoke from smudge are still heavily used in ceremonies to cleanse the mind body and spirit of negative energy and to promote healing. Proper care and respect must be taken when harvesting the plant for any purpose. Native tradition dictates that only one tenth of what has grown in a particular area can be harvested at one time and it must not be pulled out by the roots. There are only specific times of the year when it is optimal for harvest. I have learned that this information is passed down from many native elders and not common knowledge. The destruction of the plant in some areas has been attributed to those who do not respect, understand or disregard due to heavy commercial demand for the plant. We choose to purchase our sweetgrass hydrosol from those who follow and respect this process. The aroma is quite unique and similar to the freshness of cut grass or hay. The peculiar sweet fresh smell of this grass is attributed to the presence of coumarins, a chemical family known for blood thinning properties. In my opinion, it is the best natural plant which captures the scent of fresh rain. Unlike most herbs, sweetgrass aroma strengthens when the plant is dried. The plant does not produce an essential oil, but the hydrosol is quite fragrant. 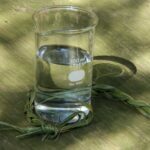 Spiritual Purification – The properties of sweetgrass as a smudge are well known, but if producing smoke is not an option, then try using the hydrosol as a spray. Simply put some into a spray bottle and use liberally. You can use it full strength or dilute with water or add other hydrosols. Try adding some sage (first diluted in glycerine) for added aroma and potency. Room & Body Sprays – Use with other hydrosols and / or glycerine as a toner to freshen or cleanse skin. Soap –Easily mixed with unscented liquid soaps for a fresh astringent cleansing feel.